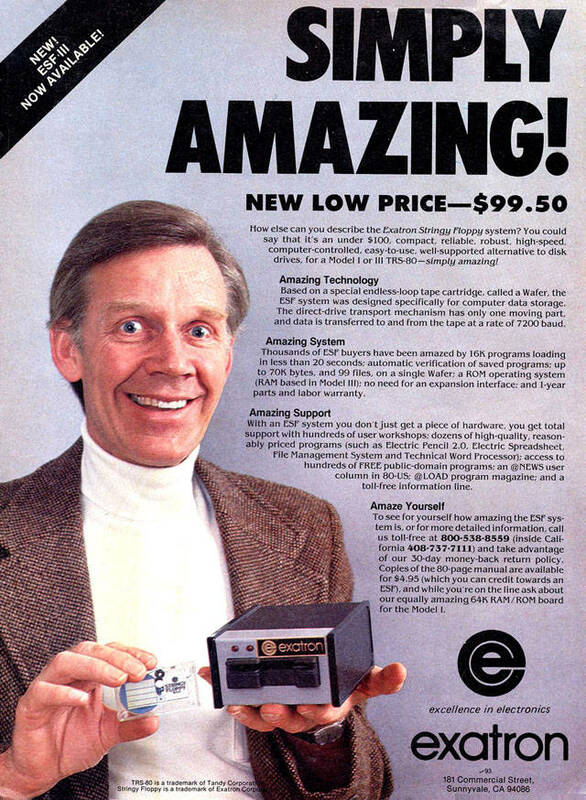 Eventually, Sinclair Research’s development work was done and, in July 1983 - after some grumbles by the Advertising Standards Authority - the company announced it would start shipping drives, along with the ZX Interface 1 add-on required to hook them up to a Spectrum, the following September. The first 1000 units would be offered specifically to the folk who had first ordered Spectrums, spun as compensation for having had to wait so long for their new computers back in 1982. It was confirmed that each 43 x 30 x 5mm Microdrive cartridge contained not a disk but a loop of tape, 2mm wide and claimed by Sinclair to be made of same same material as high-quality videotape and not what you’d find in an ordinary audio cassette. By all accounts, the Microdrives were always intended to be tape-based technology. So how did they come about? Sinclair had an early introduction to the notion of tape-loop storage in the summer of 1974. A young engineer called Andrew Grillet, who had indirectly done some work for Sinclair Radionics through a stint at one of its sub-contractors, was interviewed for a job with the company. According to Grillet, when told that Sinclair was “going to build a computer” and asked what he ideas might bring to the project, he proposed a data-storage system based on the eight-track music cartridge popular in the early 1970s before Philips’ Compact Cassette format took hold. “This would be an ideal thing,” Grillet recalls telling the Sinclair staffers, “because you could do roll-out, roll-in swapping. You’d need to have the tape shortened so you had two 64KB memory images on the track only, so you dump one and read the other, or at least if you had to wait for it to go round and switch to another track you wouldn’t have to wait too long. Speaking to The Register nearly 40 years on, Grillet doesn’t remember who he was interviewed by at Sinclair, but they were impressed by his abilities and ideas: he was subsequently offered a job, “but Xerox offered me twice as much money, so I went to work for Xerox”. He thought no more about the tape storage system until April 1982 when Sinclair Research announced the Microdrive. In his 1985 book, The Sinclair Story, Rodney Dale, a one-time Sinclair Research employee, claims Sinclair product head, Jim Westwood, and Sinclair’s Chief Engineer, David Southward, jointly conceived the Microdrive in 1982. That was eight years after Grillet’s interview. Were these men his two interviewers, and had his notion remained hidden in the back of one or the other’s mind until a new need to deliver a better-than-tape, cheaper-than-diskette format arrived? We will probably never know. It’s interesting, however, to note that Brian Flint, a long-time Sinclair electronics designer who worked on both the ZX80 and ZX81, mentioned in a recent interview with the website Polymath Perspective that “I think Jim Westwood was working on a tape drive so you could download software from an audio cassette tape” during the ZX80 development process. Of the ZX81, he added, “they did have a tape drive to go with it so you could load in programs”. Both computers used regular cassette decks for storage. Was Westwood working on a Sinclair-branded version, or is this a reference to a unit not unlike what Grillet claims was his idea? Flint stopped working for Sinclair Research before the announcement of the Spectrum’s ZX Microdrive, but other former Sinclair staff don’t recall any effort to build an ordinary tape player at any stage. Grillet wasn’t the only one to come up with the notion of looped tape storage. In 1979, Sunnyvale, California-based Exatron began pitching what it called the “Stringy Floppy”, a $100 device which took its own endless-tape cartridges, which Exatron called “Wafers”. Each wafer could hold 70KB of data on a loop of 1/60-inch tape. The company claimed 16KB programs would load “in less than 20 seconds”. Exatron launched the Stringy Floppy system for Tandy’s TRS-80 micro. Like the Microdrive, the Stringy Floppy wasn’t a random access system, but by moving the tape sufficiently quickly it was possible to make it appear to offer a kind of pseudo random access. At best the file you were seeking was just ahead of the read head’s postion, at worst the device would have to spool right through the tape to reach the requested item. Back at Sinclair, David Southward, who oversaw Sinclair Research’s work on peripheral devices, took overall control of the Microdrive project in 1982, and put the analogue electronics work in the hands of Ben Cheese, an Electronic Design Engineer. Ben passed away in 2001. He was just 46 years old, but beyond the Microdrive and other early work at Sinclair, he co-founded Flare Technology to develop a prototype games consoles for Sinclair and Amstrad, and he worked at Argonaut Software to create the Super FX graphics chip used in SNES games, including Star Fox. “Ben was a quiet, intense guy, who was as comfortable with analogue design as digital. Most of us digital guys would not touch analogue stuff. There was a neatness and elegance to his work that was a delight," says John Mathieson, one of Cheese's colleagues at Sinclair.